Home » serum » How Much Better are Antibiotic Ear Drops Compared to Oral Antibiotics? Antibiotic ear drops deliver vastly higher amounts of antibiotics compared to oral and even IV antibiotics. There is no comparison. It is literally 300 times better than oral antibiotics. The catch is that the ear drops need to get down to where the infection is in order to work, whether into the ear canal (if dealing with otitis externa or swimmer's ear) or through a hole or tube in the eardrum (if dealing with otitis media). 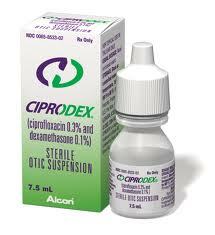 For example, two of the most common ear drops prescribed are 0.3% ofloxacin (Floxin) drops and Ciprodex which both contain 3000 mcg/ml of antibiotics. Cortisporin drops contain 3500 mcg/ml of antibiotic. Compare these middle ear concentrations with that found with oral antibiotics after ingestion. However, oral antibiotics may still be helpful in those situations where the ear drops may have trouble penetrating to the source of the ear infection. Such situations include when the ear drainage is so copious that the ear drops are not getting down to the middle ear effectively, even with tragal pumping. As such, in these situations, a few days of oral antibiotics in combination with ear drops may work better than either oral or ear drops by itself. But before resorting to oral antibiotics, I typically recommend patients to try tissue spearing first to help remove ear drainage prior to ear drops. Beyond concentration, there are other advantages of topical ear drops over oral antibiotics including avoidance of systemic side effects, especially nausea and diarrhea as well as much lower risk of multi-drug resistance infections. • Perform tragal pumping after ear drop administration to try and "push" the ear drops as deeply into the ear canal as possible. Tragal pumping is performed by pressing the tragus against the opening of the ear canal repeatedly several times. • Should the ear canal be swollen shut as found in swimmer's ear or otitis externa, place an ear wick (a small sponge) first so that any ear drops placed can be wicked down past the swollen ear canal skin. Occasionally, a single dose of steroids can be very helpful to reduce the ear canal swelling (and pain) quickly. Clinical and pharmacokinetic basis for the antimicrobial treatment of acute otitis media. Otolaryngol Clin North Am. 1991 Aug;24(4):859-75. The chinchilla microdialysis model for the study of antibiotic distribution to middle ear fluid. AAPS J. 2006 Feb 3;8(1):E41-7. Microdialysis studies of the distribution of antibiotics into chinchilla middle ear fluid. Pharmacotherapy. 2005 Dec;25(12 Pt 2):140S-145S.